The job of cooking authentic artisan pizza is no small task. 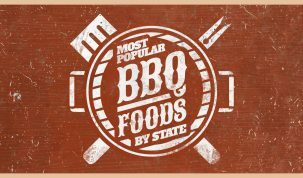 Usually this is done with wood burning brick ovens that manage to reach very high temperatures and give the food a unique flavor. 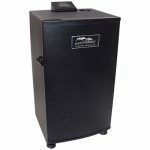 But if you’re not looking to spend thousands on a bespoke wood burning oven and instead are looking for a cheaper, more portable alternative for your backyard then this might be just the oven for you. 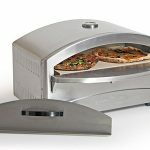 In this review we’ll cover everything you need to know about the Camp Chef Italia Artisan Pizza Oven and let you know if we think it’s worth your money. You get everything you need to start cooking. In the box is the main pizza oven body, a front panel and a propane regulator and 5 foot hose to connect to a standard propane tank. Also included is a manual to help with assembly and operation. 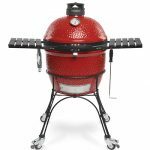 The Camp Chef Italia Artisan Pizza Oven was designed specifically after traditional wood fired brick ovens. It has a somewhat similar dome shape to traditional ovens and uses a double layered ceiling that enhances the heating dynamics. 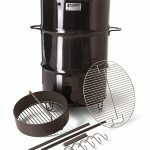 This give the Camp Chef pizza oven a very similar cooking style to traditional ovens and is one of the closest experiences you’ll get whilst cooking on gas. Underneath the hood the Camp Chef pizza oven boasts a 17,000 BTU burner that has been specially designed for this pizza oven. There are also specifically designed heat plates to help ensure even cooking and high temperatures. For that authentic, artisan style pizza very high temperatures are required. The Camp Chef Italia Artisan Pizza Oven can comfortably reach oven temperatures of over 700°F (371°C) and stone temperatures of 650°F (343°C). 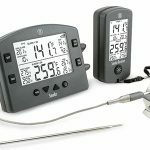 These temperatures are more than enough to allow high quality, artisan style pizzas to be cooked. Not only can it reach very high temperatures, but it can reach them very quickly. The Camp Chef Italia Artisan Pizza Oven can reach cooking temperature in as little as 15 minutes. 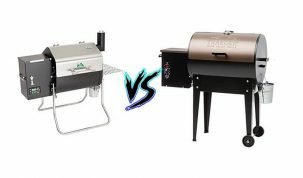 One of the major factors to think of when buying any kind of outdoor oven, especially pizza ovens is how quickly they can reach cooking temperatures. Traditional brick ovens are notorious for taking a long time to reach cooking temperature so to be able to go from cold to cooking temperature in 15 minutes is very good. The Camp Chef pizza oven also has a built in ignition and micro adjust value that gives your easy control over the flame. 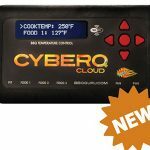 In addition to this is has a built in thermometer so you can keep the oven at the perfect temperature if you’re looking to cook something other than pizzas. Included is a ventilated oven door with a handle, which allows for greater temperature control and superior storage. The Camp Chef pizza oven also has the ability to be fuelled in multiple ways. It’s only as propane pizza oven so cannot be fuelled with wood or wood chips, like the Uuni 3. 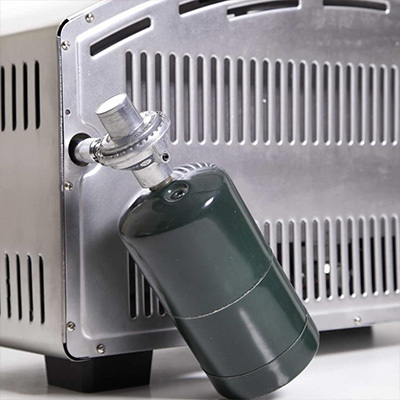 But it has the ability to be ran on a 1 lb disposable propane bottle or can be ran on a standard propane tank using the included regulator and 5 foot hose. The entire oven is built from stainless steel so it doesn’t exactly look like a classic Italia pizza oven, but it does mean that the build quality is generally very good. 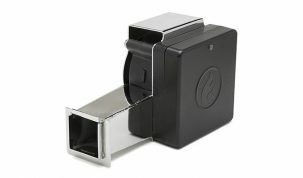 The stainless steel can be a little thin in places and we’d like it to be a little beefier but generally it’s very good. The design is nice for what it is. 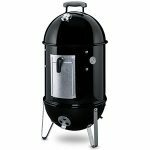 The stainless steel has a good finish and the front panel makes a good looking complete product. It would be nice if the cooking area was a bit bigger and the roof of the oven a little higher so you can cook a greater variety of food, but it works well enough as it is. 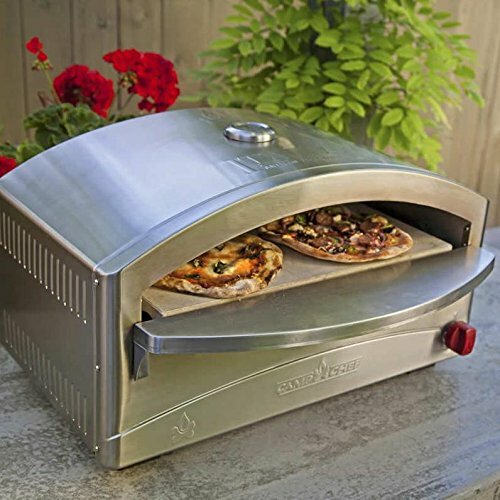 The Camp Chef Italia Artisan Pizza Oven is incredibly easy to use. From the moment you take it out of the box to eating your first pizza there is very little difficulty in the process. Setup and assembly is very easy, the only problem people might have is with the gas connection. Whilst it is as simple as other pizza ovens, such as the Blackstone pizza oven, it might be a bit tricky if you’ve never done it before. When you have the oven assembled and the propane tank connected, setting up and controlling the oven is very simple. Keep an eye on the thermometer and adjust the temperature accordingly. Better yet, invest in a laser thermometer to see when the stone is at the perfect temperature. 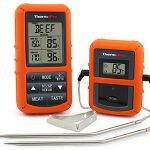 Read our guide to the best laser thermometers for cooking for more information. Once the pizza oven is hot and ready to cook the process of cooking a pizza is just as simple. Use a heavily floured paddle to easily move the pizza around the oven and let the oven do its job. Make sure the you keep your attention on the pizza as it is easy to over cook or burn it. The only negative about the ease of use is the manual. It doesn’t do a great job at explaining the assembly process and honestly we think you will be better off simply not using it. Simplicity – The Camp Chef pizza oven is probably the most user friendly pizza oven we’ve used. 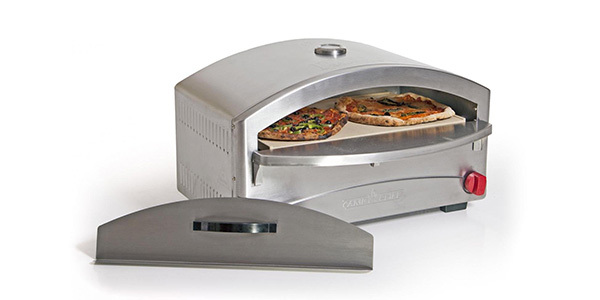 It’s easy to assemble, easy to control and easy to cook fantastic pizza on. Quality Pizzas – Whilst it’s not quite the same as cooking on a proper wood fired brick oven, the Camp Chef Italia Artisan Pizza Oven does a great job at getting an artisan style pizza. The double layered ceiling and the quite small cooking area help to get the temperatures very high and add to the final quality of the pizza. 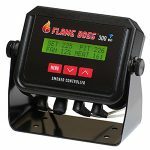 Temperature – The Camp Chef pizza oven can easily reach very high temperatures due to its quality burner and heat plates. This helps with the efficiency of cooking several pizzas. But what we really like is that it only takes 10-15 minutes to get up to operational temperatures. We generally cook on a home made wood fired brick oven which can sometimes take several hours to reach cooking temperature due to its size. This, on the other hand, is perfect for quick and easy pizza. The Size – Whilst this is perfect for people that want to cook one or two small pizzas at a time, if you want to cook a pizza over 12 inches you’re simply not able to. The size also means that you’ll need a smaller pizza peel as a standard 12 inch peel will likely be too big and impractical when moving the pizzas. Also, the roof of the Camp Chef pizza oven is quite low which reduces the versatility as you simply can’t put bigger trays or food items in it. Lacking the Wood Flavor – This is a minor complaint as it does produce great quality pizza, but there is a little something that it lacks in comparison to a traditional wood oven. A minor note that might only be because we’re lucky enough to cook on a brick oven. So you might not even notice it. 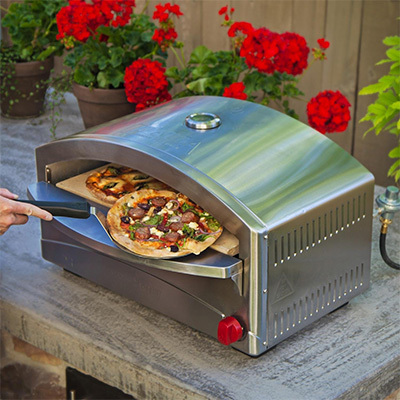 Overall, we think the Camp Chef Italia Artisan Pizza Oven would make a great addition to any outdoor kitchen. It’s incredibly simple to use and produces great quality pizza all at a very reasonable price. 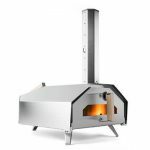 Despite a few small problems we think this is one of the best pizza ovens you can buy today and would highly recommend it. 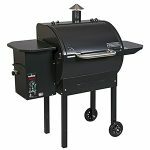 Check the latest price of the Camp Chef Pizza Oven on Amazon.